So the weather bomb passed through Auckland yesterday, and today we have beautiful blue and sunny skies. I just had to take advantage of the lovely weather and go out for a walk, and what a better place to spend an hour this morning than a beautiful reserve in Grey Lynn. Kien was keen, and he took off as soon as we got on the path. He collected sticks along the way. What for? So he can throw them over the edge, hoping for them to land in the water. He would find a stick on one side of the path and toss it over the edge on the other side. This game went on for a really long time (there were lots of sticks to be found and tossed!). I had to coax him to keep walking and find us a spot for lunch. We found a nice little spot under some gum trees. In between bites of quiche he ran around, and climbed the stone steps close by. Look how big they are compared to him! From the bakery where I got the quiche I also purchased a few little decorated biscuits (because they caught my attention in the display cabinet looking so pretty). Imagine my surprise when Kien ate a whole one, and then asked for another! ...and ran all the way out of the reserve to the car. 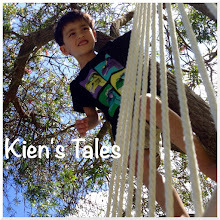 Kien looks so happy and active! Oh cute! he played Pooh Sticks :-). They do like to run don't they! Gorgeous photos!